Musa Kart, the world-renowned political cartoonist for Cumhuriyet newspaper, Istanbul is one of several staff pending trial for “crimes on behalf of the Fethullahist Terror Organisation and the outlawed Kurdistan Workers’ Party (PKK)”. Accused of collusion in last summer’s attempted coup in Turkey, these journalists are just a few of the great many academics, public servants and media workers who have been fired, detained, questioned or jailed by the Erdoğan regime in recent weeks. Kart’s regular panel in the paper has been printed with a blank space since his arrest. 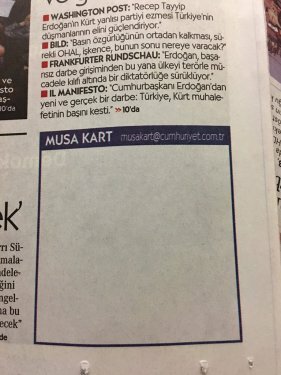 Today, in conjunction with Cartooning for Peace and Cartoon Movement and ahead of Human Rights Day at the end of this week, we make a statement on behalf of Musa Kart. On the 31st of October the homes of a number of staff from Cumhuriyet, Turkey’s oldest national daily newspaper, were raided and under emergency powers they were detained for questioning without legal representation for five days. On the 5th of November nine individuals were formally arrested and jailed pending trial for “committing crimes on behalf of the Fethullahist Terror Organisation and the outlawed Kurdistan Workers’ Party (PKK)”. did the ACC sign on to this or have they released their own statement?